Kenan Malik has a post asking when does criticism of Islam becomes islamophobia? This is a matter of principle. Thought crimes are wrong, period. And that’s exactly what “Islamophobia” is, a word coined to convict someone for what he thinks. It is a secular fatwa, and I find it terrifying that so-called freethinkers are so eager to use it or consider it as something else, other than a shortcut for censorship. When it comes to free speech, religions are fair game, blasphemy is fair game. “Islamophobia” is an ad hominem fallacy – even worse, is a censorship attempt, is a cop-out. On the other hand, a phobia is “an exaggerated usually inexplicable and illogical fear of a particular object, class of objects, or situation”. It looks to me, fearing Islam, Christianity or any other religion is neither illogical, nor exaggerated – irrational beliefs are harmful, religions are the root of almost all evil, so it’s quite rational and self-preserving to fear them. I would agree that the term has been abused, just as most terms expressing bigotry have been, to one or other degree. However, your supporting arguments are not persuasive. Whether or not a given term has, in a particular language, parallel terms for other substrates does not imply that it is not a “thing”. Word-generation in a culture is often arbitrary, stochastic, and given to faddish trends. That observation changes nothing about the meaning, the actual social problems that exist, or anything else. The vocabulary itself may be prejudicial, and that would be an argument I could accept. “Islamophobia” is not a thought crime. 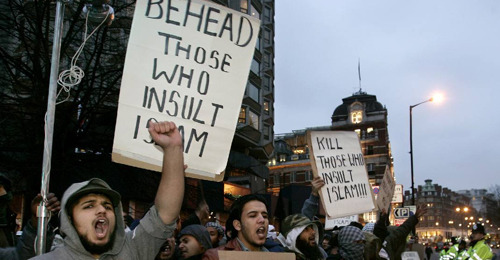 It isn’t a crime at all, so far as I know, no person has yet been arrested (in the west) for hating Muslims. It is not an ad hominem fallacy. Such a charge could apply to a particular kind of exchange involving an accusation of Islamophobia, but the term itself can not logically be such a thing. The moral wrong of this kind of phobia is in treating individuals by some perceived attribute of their class. I would hope anyone would immediately see how wrong that is. The social and political harm done by “religion” does not justify treating individual people with disrespect or prejudice. In my country, people have freedom of religion. As far as I am concerned, any of my fellow citizens should be able to choose to be Muslim and be accorded dignity, rights, and opportunities society and government provides anyone else right up till the moment they say or do one of these things you fear they will do. But not a moment before. Although he’s a far-right loon, Geert Wilders went to trial just for holding so-called “islamophobic” points of view. He wasn’t convicted, but the fact there was a trial at all says a lot about this. Look at Greg Greenwald et al. trying to shut up Sam Harris just because he has comitted the awful act of treating Muslims like first-world citizens and taking their beliefs to task. Or how Richard Dawkins was attacked for just stating a fact: Muslims hasn’t got as many Nobel prizes as non-Muslims. Robert Redeker has to live in hiding and with bodyguards just for writing an op-ed on Le Figaro. Salman Rushdie lost eight years of his life for writing a book! We agree here – that’s a generalization fallacy and it’s always wrong (be it racism, religious discrimination, sexual discrimination, affirmative action or any other). I would too… but evidence has shown us wrong. There are racists, religious bigots and sexist people out there. And, as you can see, I am not advocating for that. Actually, the opposite is the whole point of my post: you don’t treat individual people with prejudice because or their religion… but you don’t also give their beliefs a free pass – that’s just as patronising, and that’s what “Islamophobia” has come down to: secular fatwas (just like Maryam Namazie puts it). I have to disagree: They (and anyone else) should be entitled to *say* whatever their thoughts are, as long as that’s not libel or an order to commit a crime. I will accept your citation of Geert Wilders. But if all that you have is one non-conviction of a nutjob whose party actually become more powerful as a result… well it isn’t exactly hard proof of the looming specter of thought “crime” silencing speech (for the record, I strenuously oppose “hate speech” laws, in the Netherlands and elsewhere). Greenwald may have acted poorly against Sam Harris, but unless he is a policeman arresting him and a judge or jury convicting him, it is not a crime, just bad behavior which you are apt to point out. But I could as easily abuse *any* concept for ad hominem or silencing purposes, without my bad choices making those concepts themselves bad. They might be, but you have to prove it. Folks like Rushdie are endangered by radical psychopathic nuts, not popular public opinion or law (both of which tend to protect him, in fact). It’s worth noting Rushdie’s book wasn’t actually anti-Islamic. The Fatwa against his life was issued in 1989, before the word “islamophobia” existed so far as I am aware. There is nothing in the idea of “islamaphobia” that suggests we give anyone a free pass, as indicated by the key word “irrational”. Some people misuse the term “sexism” and claim that an any affront against a particular person is sexist. Such a hypothetical person would not prove that the concept of “sexist” is not useful or “a thing”. Therefore it seems to me more reasonable to criticize the abusers as exploiting liberal guilt and PC sensibilities to deflect appropriate and necessary criticism of Islam or of Muslims. This is sensible if for no other reason than you post above is likely to give to impression you throw in with radical bigots who do act on hate and xenophobia instead of reason. I’d just as soon avoid such an appearance, no matter the falsity of it. Agreed. But, so far, I haven’t seen a rational, good use of the term “Islamophobia”. I’d love to see examples of this. Why? I’m calling for the exact opposite – be rational, don’t patronize anyone, don’t give free passes to any religion (or irrational belief for that matter) and don’t cop-out with ad hominem/strawmen fallacies. How come any of that comes across as xenophobic or hateful? Thanks for the advise, I’ll try my best not to give such false impressions. I’ll give you one right now. 300 Sikhs have been attacked and some murdered by Islamophobic bigots since 9/11. This isn’t my preferred phrasing, but it seems an apt one. How come any of that comes across as xenophobic or hateful? Because your arguments are a bit heavy-handed, intemperate, and inadequately supported; exactly of the kind of a person who is neurotically attacking an apt accusation that they are bigots (naturally I know that you are not such a person). We must take care not to lose perspective. Although we may be activist secularists and know the harm that religion incurs on society, we should not be so overeager to attack its defenders, even its irrational defenders, that we sacrifice rigor, oversimplify, or ignore the broader strategic picture. My advice is to produce and support reasoned, thoughtful criticism of Islam and if and when people try to dismiss it unduly as “phobic”, then address and dismantle that claim. This is both more useful tactically, and more sound strategically. Okay, I can call that “Islamophobia”. Please, take into account it is also a -quite henious- crime. It’s not “criticism of Islam”, which was the question Malik posed: when does criticism of Islam becomes Islamophobia? Do you think we should make a distinction? I’m of the opinion that making such a distinction is, not only subjective, but can become a slippery slope to censorship. What are your thoughts on that? You said “There’s no such thing as Islamophobia”. That is an absolute statement unbounded by topic or context. I don’t see the slope as slippery. As an American, what I see is loads of injustice and bigotry aimed at anyone who seems to be Muslim, whether they are or not, and I am opposed to injustice. I don’t see my countrymen falling over themselves to censor anti-Muslim sentiments expressed. Now that said, I think we can agree this particular word is abused by some, and prone to abuse. But that isn’t new, and the word doesn’t enable that kind of abuse. I’m one of the guys who organized and carried out this protest http://www.illinissa.com/2010/04/chalkin-it-up-to-free-speech-aaf-stands.html , for which I was subsequently called a bigot in the national press. Nobody had to use the word “Islamaphobe” to insult me and belittle my convictions. When I see Muslims do something about the raging kaffirphobia in their religion, I’ll bring myself to care. Evil ideas deserve condemnation. I like that post of yours!